VitaltyHealth — Health Insurance that rewards you for being healthy. Your friend %referrerforename% %referrersurname% has health insurance with Vitality and thought that you might like to take out a plan as well. 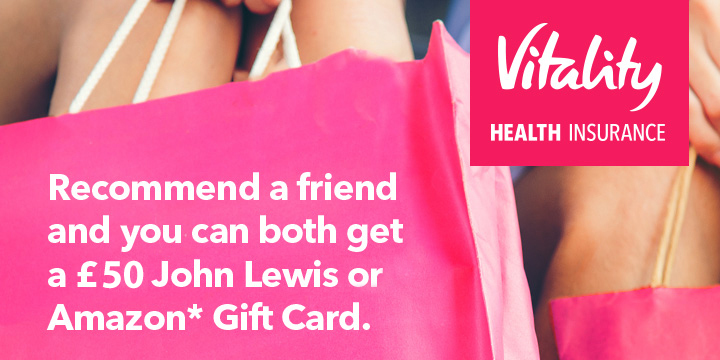 If you do, you'll both get a £100 John Lewis Gift Card or Amazon* Gift Card. To be eligible for your rewards, you'll need to register your details before you take out your plan. Once you have had your plan for three months, we will notify you and the friend who referred you about how to claim your rewards. Please note: If you buy your plan online, be sure to do so using the same device (PC, tablet) that you used to register. 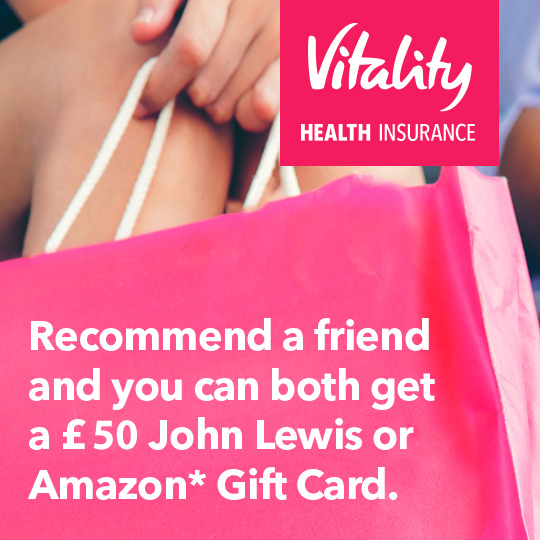 Alternatively, if your friend gave you a short referral code, you can buy your plan by calling 0800 775 599 and quoting the referral code to register.